Place the game board in the table middle. Separate the food tiles by value and place in stacks on the hunting grounds. Place the 20 wood resources in the forest, 16 brick resources in the clay pit, 12 stone resources in the quarry and 10 gold resources in the river. Separate the tools by values 1/2 and 3/4 and place them in two stacks in the space next to the tool maker. 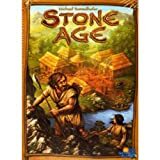 Shuffle the civilization cards and place as a face down stack next to the game board. Draw the top-most 4 cards (based on number of players) and place on the 4 spaces, from right to left. Shuffle the building tiles and place in 4 face down stacks of 7 buildings each. With 4 players, place all 4 stacks on the game board; with 3 players, place 3 stacks; and with 2 players, place 2 stacks. Return unused stacks to the box. Turn over the top-most building tile on each stack. Each player chooses a color and one marker of his color on space 0 of the food track (lower left) and one on the scoring track (upper left). Each player takes 1 player board. On this, he places 5 people in his color and 12 food. The player boards serve as places for game material, game play information, and final scoring information. Place the remaining people (5 per color) as a general supply next to the game board. Also place there the 7 dice and the dice cup. Choose a start player and begin the game. The players place their people on the game board. The players use the actions of their placed people. The players feed their people. The start player begins and must place 1 or more of his people on one place of his choice. Then the next player in clockwise order follows and must also place 1 or more of his people on one place of his choice. This continues in clockwise order until all players have placed all their people on the game board. The number of rings in a place indicates how many people can be there before it is full. Passing is not permitted, if there are still places available for people. Placing again is not permitted. Since the individual places accept different numbers of people figures, it often occurs that one or more players will have no more people figures to place while others still have people figures they can place. If no player can place people figures (because each has already placed all his figures or each has no legal places to place the figures he has), the 2nd phase begins. Each tool tools can be used only once per round to roll a die with the hunt or during resource procurement. A tool can be only completely used. Thus, it can split and used later for a different action. A player can add as many of his tools to a dice roll. In order to show that a tool was used, the player turns it around by 90°. The player takes 1 die for each of his people figures on the hunt and rolls them all together. He adds all the pips on the dice. Then he can add as many of his tools to the total from the roll. For each full 2 of the thrown total, he takes 1 food from the game board. Forest - for each full 3, the player takes 1 wood from the supply. Clay pit - for each full 4, the player takes 1 brick from the supply. Quarry - for each full 5, the player takes 1 stone from the supply. 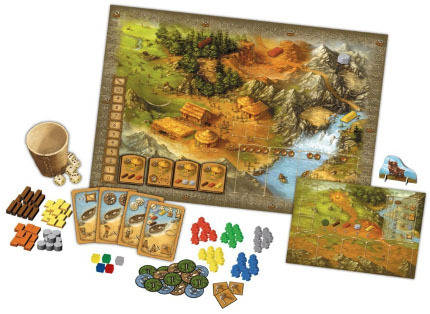 River - for each full 6, the player takes 1 gold from the supply. The player pays the number of resurces shown above the card to the supply from his player board and takes the card. 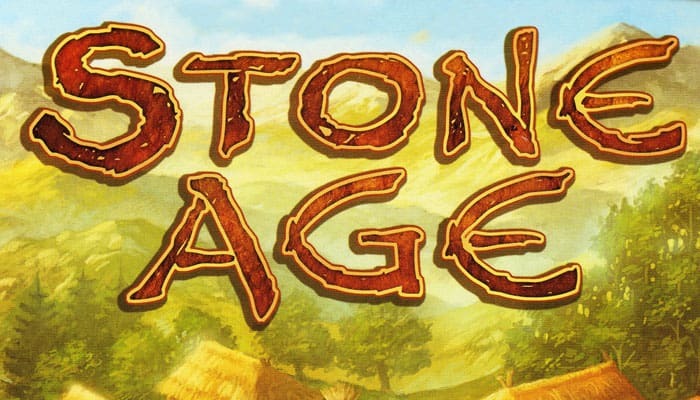 Which resources the player pays (from wood, brick, stone, and/or gold) is up to him and what he has: usually it will be wood and/or brick, but he can never use food. If the player cannot or does not want to pay the required resources, he takes back his people figure and leaves the card on the game board. Each player stacks his acquired civilization cards face down on the designated space on his player board. The player pays the resources shown on the building to the supply from his player board and takes the building. Then the player immediately moves his scoring marker on the scoring track by the number of spaces shown on the building. Afterwards, he turns over the next building on this stack. There are 8 buildings where the player can choose which resources to pay with, but the number is fixed. And there are 3 buildings, where the player can choose both the kind and number of resources to pay with (maximum 7). When a player takes one of these buildings, he must calculate the number of spaces (= points) he moves on the scoring track. First, each player takes food from the supply according to the postion of his marker on the food track. 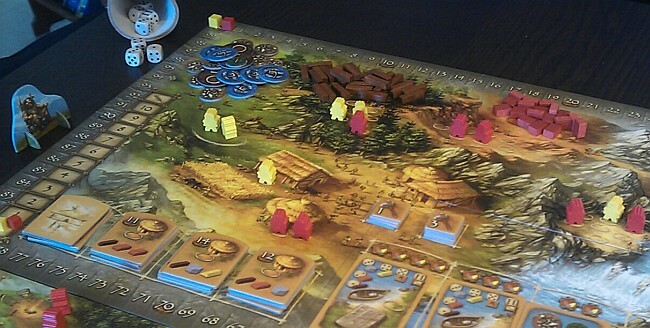 Then each player returns 1 food to the supply for each people figure on his player board. If a player does not have sufficient food to feed his people, then: He must place all food that he has back into the supply. Then, he may, if he wants to (and can), pay the remainder in the form of any resources into the supply. Each resource replaces 1 food. Thus, his people are also content as they were able exchange the resources for food). If the player cannot or does not want to do this, he immediately moves his scoring marker backwards 10 points on the scoring track. In such case, the player must return all food he has to the supply. When all players have fed their people (or not and lost 10 points), the round ends. The start player gives the start player marker to his left neighbor and the next round begins. 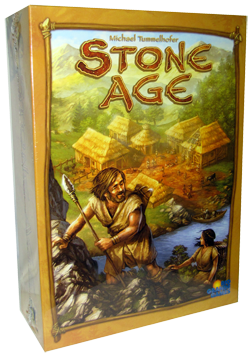 If there are not enough civilization cards remaining to fill the display at the beginning of the round, the game ends immediately. In this case, no new round is begun. If at least 1 building stack is empty. In this case the current round is played to the end, i.e. the people must still be fed. Multiple the different civilization cards with the green backgrounds by themselves. 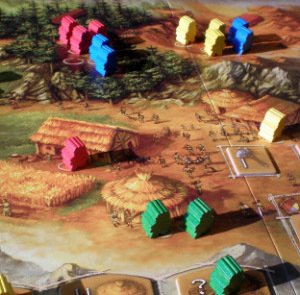 Multiple the number of farmers by the position of the player's marker on the food track. Multiply the number of tool makers by the value of the player's tools. Multiply the number of hut builders by the number of buildings. Multiply the number of shamen by the number of people. Players move their scoring markers to score their points as they tabulate them. The player with the most points is the winner! If players are tied for most, the player among them with highest total of food production, tools, and people is the winner.